While my friend David Tracy is working his knuckles to the bone in a frigid Michigan garage trying to bring a dilapidated postal Jeep back from the dead, I would like to take this opportunity to congratulate myself for finding possibly the only car mod that’s easier than applying stickers. That’s right friends, behold, the headrest swap! 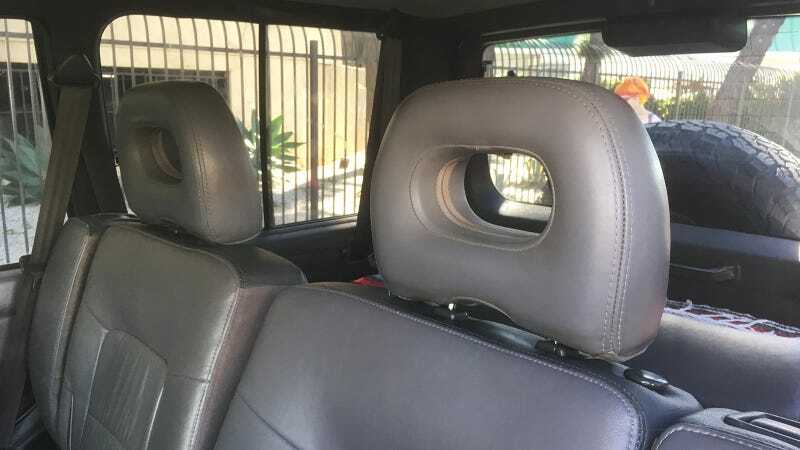 Weeks ago I was detailing the interior of my 1998 Mitsubishi Montero and realized that the front headrests are these big, cool donut-style ones with open middle areas while the rear headrests are just dumb dinky pillows. Besides just liking the “open center” headrest design that was pretty common in interesting cars in the ’80s and all kinds of cars in the ’90s, I thought the whole interior would look more cohesive if the front and back headrests matched. Test-fitting was simple–I just pulled a front and rear headrest out, then tried putting a front one in the back seat’s headrest holes. After confirming the big headrest conveniently slid right into the slot in the backseats, I added “front headrests” to my list of items to look for in junkyards but actually ended up getting a set off a fellow member of a local Montero Facebook group. So now I have four matching headrests! This is a pretty common modification in the Montero community, and maybe a similar swap will work on your car. I’m not going to accept any responsibility for changes to crashworthiness that might occur as a result of changing your headrests, but I feel like you’d be fine as long as you’re using OEM pieces.